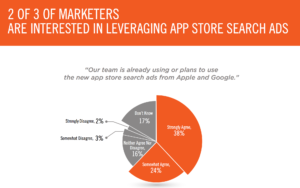 Why Invest in App Store Search Ads? 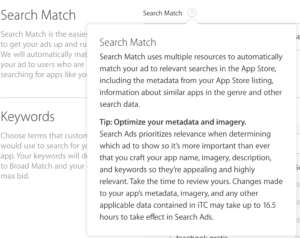 We've already covered why we think App Store search ads are Apple's gift to iOS marketers from a high-level and quantitative perspective. Today we'll keep it brief and explain in three bulleted sections why Apple's App Store search ads are worth paying attention to. 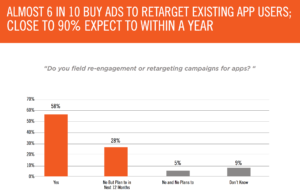 According to a Q3 2016 Apsalar Mobile Marketer study on app marketers across the globe, 2/3 say they plan to spend money on App Store search ads, and 90% say they plan to spend money on a retargeting campaign within one year. Per Apple's own studies, "over 65% of downloads come directly from a search on the App Store." A TUNE study on app store search cited the Apple research above, as well as Fiksu research that "80 percent of quality organic Android downloads come from Google Play search." Search ads allow you to market directly to the most popular method for discovering new apps, per above. Search ads are a 1st party ad, meaning you get more data from running a search ad campaign than from a 3rd party ad, such as Facebook Ads. For example, you can finally link install data to keyword searches; 1st party ads also present the best possible scenario conversion rate because they require 1 click to install. You can run new app install campaigns OR retargeting ads to re-engage people who already have your app installed. While Apple's search ads platform is a far cry from the abilities provided by Facebook Ads or Adwords, you can get started in about 30 seconds with automatic creative and targeting. 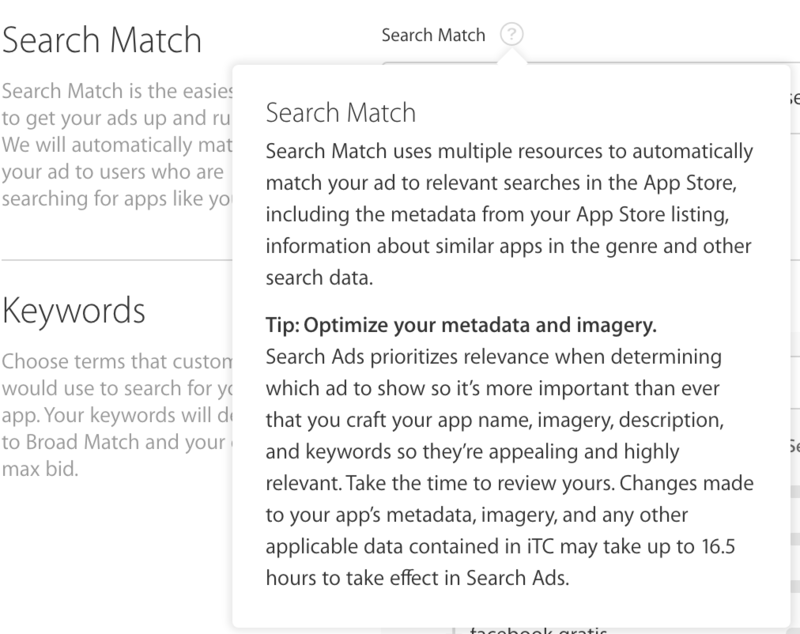 If you don't want to opt into Apple's automatic search match type, you can take control by specifying the keywords you want to target with either exact or broad match types. You can also layer on additional customization options, such as demographics or PPC campaign-critical negative keywords. That's all for now folks! For more updates on search ads, stay tuned to the Incipia blog. Contact us if you would like help managing your search ads campaigns for better ROI. Team Incipia has spent years managing keyword-optimized campaigns, from SEO, to PPC to ASO and optimized for CPI, CVR, ARPU and ROAS. We have provided optimization strategy for hundreds of clients including Airbnb, the NHL and Spotify and developed a multitude of advanced keyword optimization techniques, honed through millions of clicks, installs and advertising dollars.